Academic Symphony Orchestra of Chernivtsi Philharmonic Society. 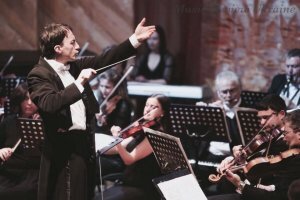 The first concert by the Symphony Orchestra of Chernivtsi Philharmonic Society took place in Chernivtsi in 26 November 1992. It was organized by the Honored Artist of Ukraine Viktor Kostryzh and the Head of Chernivtsi City Council Viktor Pavliuk. Since 2000 Chief Conductor and Art Director – Josyp Sozansky. 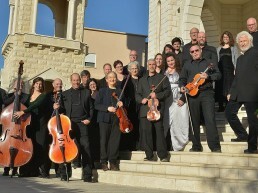 The orchestra performed on tours in Ukraine and abroad (Italy,Spain, Portugal, Romania, Croatia, Germany,Poland, Austria, Holland, South Korea) received positive reviews in the press. It has performed many times on the stage of Teatro Petruzzelli (Bari), Teatro Politeama (Catanzaro), Palau de la Musica Catalana (Barcelona, Spain), Seul Arts Center, Kyiv National Philharmonic Society of Ukraine. It took part in international festivals of contemporary music “Kyiv Music Fest”, Days of Swiss – Ukrainian Culture “Kammerton”, “Days of Bukovyna in Kyiv” (Kyiv),international festival of contemporary music “Kontrasts” (Lviv), international music festival named after P.Chaikovsky (Vinnytsia), international music festival “Stravinsky and Ukraine” (Lutsk), international music festival named S.Richter (Zhytomyr). Great impressions remained after cooperating with famous artists: D.Hnatiuk, M.Stefiuk, N.Matvienko, V.Gerello, A.Shkurhan, S.Krylov, B.Kotorovych, A.Ferro, A.Bielov, B.Pivnenko; conductors: K.Kaminsky, O. Lyniv, F.Mastrangelo, E.Savchuk, L.Castriota, I.Blazhkov, G.Penteleichouk, M.Volloch. V.Silvestrov, M.Skoryk, E.Stankovych, l.Dychko,M.Kuzan, S.Turkevych, I. Laakso, M. Volynsky, I.Panov. G.Verdi: Aida, Nabucco, Il Trovatore, La Traviata, Rigoletto, Ballo in maschera; G.Rossini: Barbierre di Sivglia; G.Puccini: Madame Butterfly, La Bohème, Tosca; P.Mascagni: Cavalleria rusticana; G.Bizet: Carmen; J.Strauss: Die Fledermaus, Der Zigeunerbaron. Among ballets: P.tchaikovsky: The Nutcracker, Swan Lake, Sleeping Beauty; S.Prokofiev: Cinderella, Romeo and Gulietta. Mozart – Requiem, Cronung mass; Dvorak – Mass in re, Verdi – Requiem, Puccini – Messa di Gloria, Strawinsky – Requiem Canticles, Symphony of Psalms, Rex Edip; C.Orf – Carmina Burana, Beethoven – Symphony № 9. Repertoire of symphony works include all symphony of Beethoven, Schubert,Mendelsohn, Brahms, Schumann, Rachmaninov, Tchaikovsky. D.Shostakovich – symphony 1, 5, 10,15; Prokofiev – symphony 1, 7; B.Mussorgsky – Pictures at an Exibition, L.Janacek – Taras Bulba, O.Respighi – Pini di Roma,B. Bartok – Concerto for Orchestra, I.Stravinsky – The Firebird, Rachmaninov – Symphonic Danses, Bruckner – Symphony 1, 4, Mahler – Symphony 1,4; Debussy – La Mer, M.Ravel – Rapsody Spagniola, Bolero; Elgar – Falstaf, In the South, Enigma; V.Williams – symphony 5, Norfolk Rhapsody 1, In the Country. Works of Ukrainian composers: M.Verbytsky ,V. Barvinsky, B.Liatoshynsky, L.Revutsky, E.Stankovych, R.Prydatkevych, S. Turkevych, M.Skoryk. Thanks to cooperation with Swiss, Austrian, Italian, Fin, Rumunian, Korean Embassies, the orchestra carried out numerous art projects, which were approved by the audience. Orchestra was recorded CD “Mozart and Salieri”, “Leonid Zatulovsky”. Having in the repertoire works of composers of all the epochs, the orchestra has performed at more than 50 concerts yearly.